Partners Personnel is a staffing agency with many locations nationwide. We made them a channel letter sign for their new Valencia, California location so clients could find them easily. An illuminated sign can also catch the attention of potential clients driving by. From the photo, you can see that the channel letters are custom made to match their logo exactly. To build this custom channel letter sign, we first got the client’s logo and location of where the sign is going. Most exterior signs need to be permitted and in order to pull a sign permit, the sign needs to be up to code with the regulations that the particular city has. We created a proof of the sign based off of the client’s logo and the city regulations of Valencia. Once we had the customer and landlord approval, we were able to take the approved design along with the proper paperwork to the city to secure a permit. We do not start manufacturing until we have the permit pulled in case the city has any revisions we need to make. When creating customer channel letters, we custom bend the returns based off of the logo and lettering and route the backs and faces to match. The backs are made from aluminum, but since the sign is front-lit, the faces are made from translucent acrylic. For the different colors, we used pre-colored translucent vinyl that we laid onto the white acrylic faces so when the LEDs inside of the channel letters are on, the faces light up to the logo colors. The sign was installed with a raceway behind the wall because the building had a parapet wall. 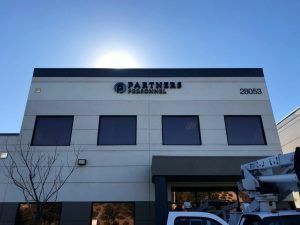 If you are opening another location of an established company, you want to make sure that your signs match the other location’s signs, and the logo used for other marketing. Call us today for your custom channel letter sign.